An inside look at our cover model’s diet! 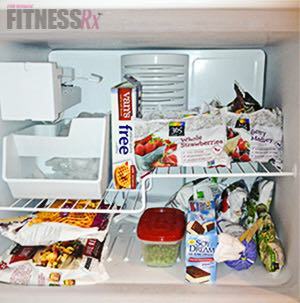 Ever wonder what the pros and fitness experts keep in their fridge? We did, too. So we’re excited to introduce our new Fridge Peek series! 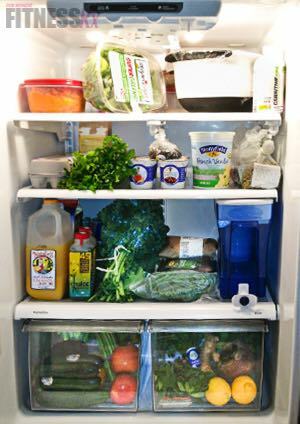 From time to time, we’ll talk to the fittest people we know and make one simple request— show us what’s in your fridge! There’s tons of great bikini abs training and diet advice in our June issue from Juliana Daniell— IFBB Bikini Pro and June cover model. But what exactly does Juliana keep in her fridge in order to stay tight and toned? 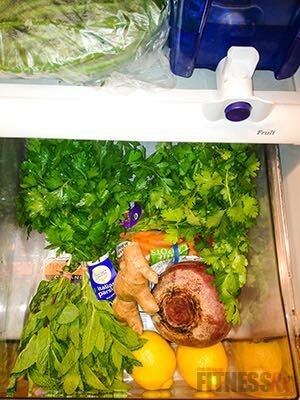 Recently, Juliana sent us some fridge photos, allowing us to take a peek inside. Here’s the conversation we had about the contents of her fridge! I really don’t have one store I always shop at. I’ll go to Whole Foods, Kroger, Publix, the farmer’s market and even some of the smaller markets that we have here in Atlanta. I like to get different brands of things and not all the stores have everything, so I mix it up. Plus, changing up your shopping place/scenery can inspire you and keep you excited about cooking and eating clean. How do you shop— with a list, always buying the same things, or do you just wander and get what interests you in the moment? Well, I usually make a list of the things I need to restock on and then more often than not, I leave it at home by accident! Haha! It’s terrible! I have a few things that are staples to my shopping sprees. But I really enjoy grocery shopping. I like to just wander the aisles to see what type of things jump out at me that I could put together and eat for the week. Sounds exactly like what I do! 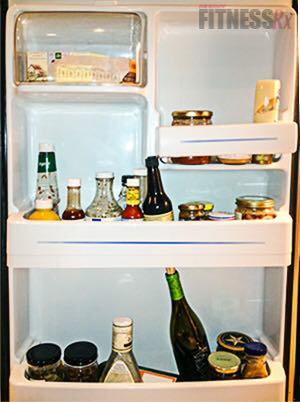 So, looking at your fridge pictures…what’s in the bowl on the top shelf? It’s a salad concoction I made— kale, beets, raisins, peanuts, carrots, Parmesan cheese, peas, tri-bean blend, zucchini, squash, mandarin oranges, salt and pepper! Interesting mix— sounds pretty good! On the top shelf I see Supergreens. Why do you like the Supergreens? Do you always buy organic? Supergreens of any kind are great— powder form or food form! I like to mix them in my salads for extra flavor/texture and also in my morning smoothie if I need an extra veggie boost. I try to buy mostly organic; it tastes better, and it’s better for you. Yes it might be more expensive, but when I know exactly what it’s made with, how it’s made, etc. it’s worth the extra money. I know I’m feeding my body the best, and most natural, way I can. If you’re putting in the hard work in the gym and doing everything perfectly there, why skimp on your food when it’s the most important part of the puzzle? Very true. Now, is that mashed sweet potato in the tupperware? How do you make it? Yes it is, but made a little differently than most! My boyfriend taught me a new way that I love and honestly makes the sweet potatoes even more delicious than they already are. I bake the potatoes in the oven till they are soft, immediately remove the skin, and use a drum sieve to make them creamy and soft. It’s a little bit of an arm workout to get them like that but I promise you it’s worth it! Wow, I might have to try that! Good stuff. I also see orange juice and I’m interested to know— when do you have that? I’ll add it to my smoothie in the morning if I want a little extra flavor or liquid. Or I’ll just have a small glass sometimes when I just want something other than water. I buy the all-natural kind so I know there’s nothing but pure freshly squeezed orange juice in there. I see you have a big piece of ginger…what do you use that for? I sometimes add a little bit to my morning smoothie. I enjoy the flavor of ginger and not to mention it’s really healthy and good for you to have! OK, so I can’t ignore that bottle of wine in the door. How often do you have wine? Well it really depends on the week, what’s going on in my life, special occasions, etc. I might have one glass a week, two glasses a week, or none for three weeks! It just varies. I’m really not a big drinker and honestly think I have an allergy to alcohol because sometimes after I’ve had a glass— or really any type of drink or cocktail— I’ll wake up the next morning with hives on the lower half of my body. So I have to be careful. But a glass every now and again is nice and needed. Looks like you have some cheese in the veggie drawer, what do you use cheese for? Well, I love cheese! Usually I’ll add just a little bit to my salads, soups or meat dishes. It just kicks any dish up a notch and I’m OK with adding it to things. I can’t argue with that one, cheese is definitely one of my favorite foods. You seem to have a lot of condiments, do you use all those? What are your favorites? Well, I live with my boyfriend, so we share the fridge and the majority of those condiments are things he uses when he cooks. He’s a former chef so he’s a master in the kitchen and likes to have access to a variety of ingredients. I personally stick to the staples, ketchup, mustard and salad dressing. I don’t really use much else and honestly don’t need it because I cook with enough spices to make things taste good without needing to add condiments. OK, so other than the soy ice cream bars, I don’t see many sweet treats. Do you ever indulge? If so, what would you have and how often? Oh, of course I do! I love sweets and couldn’t live without them. I usually have a chocolate bar, or two lying around that I will snack on when I need something sweet. And I mean snack as in, like, one tiny little square— two if I really need it— once a day, if that. I try to make sure if I’m going to eat chocolate or sweets that I eat them mid-morning or afternoon and very rarely at night. The chocolate bars are normally 70 percent dark chocolate and sometimes I get the ones that have other things added to them like ginger, orange, almonds, raspberries, whatever! I also really love frozen yogurt and will treat myself to that if I’ve earned it. Do you always buy fruit frozen? Is that your smoothies? I buy fresh and frozen fruit. I like to use the frozen for my smoothies because I think it makes the texture better, but I definitely enjoy/need fresh fruit as well. I don’t put my fresh fruit in the fridge— unless it’s about to go bad— so it didn’t end up in the pictures. But I have a fruit stand that has apples, grapefruits, pears, oranges, and other seasonal fruits I enjoy. Each week I get different things. Speaking of smoothies, I know you’ve been on a juicing kick lately. Where do you get your recipes, and what’s your current favorite one? And do you have them as a meal or a snack? I get my recipes from everywhere! Just search the Internet and you will get thousands of options. But I also like making my own using the ingredients that I like. I have learned I pretty much like anything that has mint leaves or cilantro in it. This is another place I’ll use the ginger, herbs, lemon, beets and veggies. Depending on what I put in it, it could be a meal OR a snack. Usually if it’s juiced, it’s a snack. I also like to use my Vitamix for “juices.” When I use that I can make these drinks more like a meal than a snack because I can put a wider variety of items in there—nuts, seeds, raisins, peanuts, etc. And it’s way more filling this way. I use an Omega VRT350HD Juicer and love it! It uses a lower speed to juice, which prevents oxidization and allows juice to be stored for up to 72 hours without degradation. It’s slightly annoying to clean but it’s worth the work. 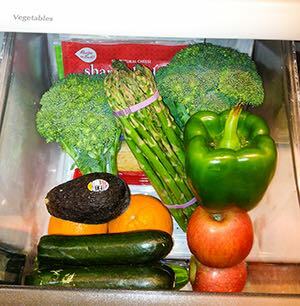 You have a ton of veggies in your fridge. If you could only have one veggie for the rest of your life, what would it be and why? Oh my gosh, this is hard to choose because I absolutely love all veggies! Years ago I probably would have said green beans, but today I might have to say asparagus. They taste good plain, seasoned, steamed and grilled! Any way you cook them they are delicious and not to mention great for you! Is there anything that’s not in the fridge that you would usually have in there? I might have a different variety of the types of things in there but that’s usually what I have. Sometimes I have bread in there (Ezekiel) but I really can’t think of anything else right now. For more with Juliana, check out the Bikini Abs BONUS exercises here. And to get in touch with Juliana, follow her on Twitter (@JulianaDaniell), Facebook (IFBB Bikini Pro Juliana Daniell) and Instagram (JulianaDaniell).